This cannon is a replica of a smoothbore Model 1841 Navy 32-pounder which stood here during the War Between the States. 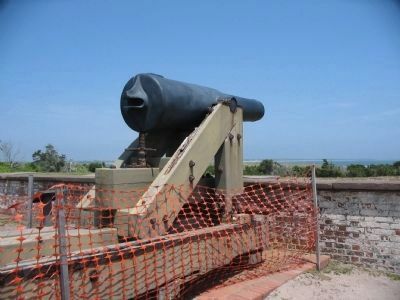 Cannons of this caliber comprised almost half of Ft. Macon's armament. 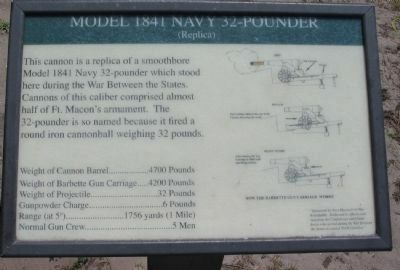 The 32-pounder is so named because it fired round iron cannonball weighing 32 pounds. Sponsored by Fort Macon Civil War Roundtable. Dedicated to officers and men from the Confederate and Union forces who served during the War Between the States in coastal North Carolina. Location. 34° 41.766′ N, 76° 40.713′ W. Marker is near Atlantic Beach, North Carolina, in Carteret County. Marker is on Fort Macon Road, on the right when traveling east. Touch for map. 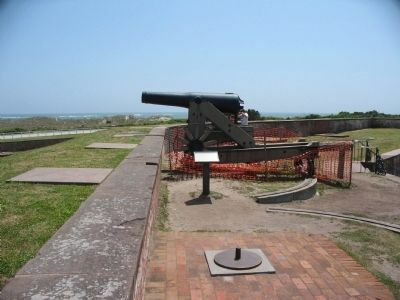 Located on the parapet of Fort Macon, Fort Macon State Park. Marker is in this post office area: Atlantic Beach NC 28512, United States of America. Touch for directions. walking distance of this marker. Hot Shot Furnace (a few steps from this marker); Model 1861 10-inch Siege Mortars (within shouting distance of this marker); Model 1841 6-pounder Field Cannon (within shouting distance of this marker); Rifled 32-pounder (within shouting distance of this marker); Welcome to Fort Macon (within shouting distance of this marker); Mortar Battery (within shouting distance of this marker); Cistern (within shouting distance of this marker); Bogue Banks Lighthouse (about 300 feet away, measured in a direct line). Touch for a list and map of all markers in Atlantic Beach. More about this marker. On the right are a set of diagrams depicting the firing sequence of the 32-pounder cannon. More. Search the internet for Model 1841 Navy 32-pounder. Credits. This page was last revised on June 16, 2016. This page originally submitted on June 5, 2010, by Craig Swain of Leesburg, Virginia. This page has been viewed 1,257 times since then and 5 times this year. Photos: 1, 2, 3. submitted on June 5, 2010, by Craig Swain of Leesburg, Virginia.